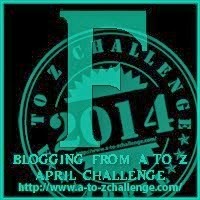 Today for the A to Z, I am going to talk about Family Friends and Fun. Sometime, all three words cannot be used together. Many people dread going to visit family, and always want to hang out with friends. I, personally do not understand this particular phenomenon. I understand, you cannot pick your family, and you may not always agree with them, but they can be loads of entertainment. The little quirks each of our relatives have will one day be precious memories. Now many participating in the A to Z challenge give great accolades to their family members. Many of the writers out on the Interweb give thanks to their family. I believe this is a great forum. My family is "special". Things today are not what they were when I was growing up. My father has overcome alcoholism and became a pastor. Talk about a change. I have married a Filipino. Talk about a change. No matter what side of the family I am with, I always seem to have fun. This past weekend, my family (Tronster and his better half) took a road trip to meet up with some friends and their family, and fun was had by all. I went through six states. (Virginia, Maryland, Delaware, New Jersey, New York and Connecticut) I also want to say , I used the entire New Jersey Turnpike for the first time (look at that, another "F"). However, I think there are two more exits I missed. We ate at a couple of Family owned and operated restaurants in Stamford, CT. Places I can share a little later in the challenge. These weekend road trips my wife and I partake in are some of the fondest memories. Build these memories, share them with your family and enjoy your friends. Another thought from Tronster, for the A to Z Challenge. I definitely think someday we'll look back and regret we didn't spend more time with family...probably not friends quite as much. Mostly, we'll wish we'd gotten to know certain relatives better and heard their stories, especially older generations.